I am a professionally trained Makeup Artist and Hairstylist who is available for Editorial Commercial Photography Fashion Shows Bridal Services Special Occasions I provide in studio and on location services in Calgary and the surrounding area. Please contact me for rates and bookings. Celebrity & Fashion Makeup Artist Vanessa Mills, Founder/Owner of VMMA, has been working in the makeup industry for over 16 years. She specializes in fashion, beauty, Avant-garde and has extensive experience in film and video. Vanessa, an honors graduate from a world-renowned makeup school (VFS), has been f..
Jeanette Schwarz is an accomplished makeup artist of 9 years, currently based out of Vancouver BC. Her position as Beauty Editor allows her to seek innovative makeup products & trends internationally; and working within these trends, is able to showcase natural/organic cosmetics through her magazine & edito..
Elizabeth is a freelance makeup artist and hair stylist. She graduated From John Casablancas with the Overall Achievement Award for both makeup as well as hair and was chosen to compete in various competitions, such as the IMATS in Toronto where she came in First for the Beauty category. She loves all areas of makeup (beauty, fantasy, a.. Creating celebrity looks for everyday women. Daneille Mattis is a certified Makeup Artist based in the GTA, she specializes in bridal and beauty makeup and has experience with fashion, editorial and film. 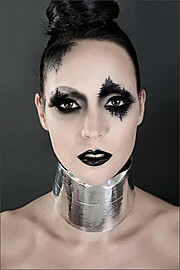 Daneille Mattis is an up and coming Freelance Makeup Artist based in Toronto Canada. As a teen growing up in Jamaica, she spent most ..
Idalia is a Makeup/hair Artist available for Bridal Hair and Makeup, Fashion/Creative Makeup, Runways and Photoshoots. She has graduated from Blanche Macdonald Centre in Vancouver BC, Canada. Born and raised in Southern Saskatchewan, Caitlyn has always been interested in beauty, hair and fashion. Blanche Macdonald supplied her with a great education and many mentors to follow. She found it very inspiring to see what others had accomplished and it all became real for her. Caitlyn competed in an international makeup competitio..
Marissa Clemence is a certified makeup artist based in Toronto, Ontario, with extensions in Ottawa. She is trained in hairstyling, fashion, theatre, film & television, as well as special effects makeup. She has taken the WHIMS course and is a permittee for NABET 700. Marissa has worked on music videos, comm.. I have been doing makeup since I first started performing at a young age and have fallen deeper in love with it ever since. I started doing my own makeup for dance competitions years ago, continued onto working for my high school drama productions, and eventually doing beauty and glamour makeup for graduation. After high school, I decid..
SFX make up artist for cinema and tv industry. emy has worked on Hollywood blockbusters such as The Mummy: Tomb of the Dragon Emperor (Rob Cohen, 2008), Death Race (Paul WS Anderson, 2008), The Punisher: War Zone (Lexi Alexander, 2008), Night at the Museum : Battle of the Smithsonian (Shawn Levy, 2009), Human (Jacques-Olivier Molon and ..